Arthrosis of the knee is one of the one of the most common joint diseases, which is caused by damage to the cartilage in the knee. It represents a chronic degenerative changes in the articular cartilage that in most cases is the result of the natural aging process or a disease. Usually arthrosis occurs after forty years of age besides knee it affects feet, spine, hips, etc. As for the symptoms of arthrosis, there is limited mobility accompanied by a constant pain in the knees and joints. A typical joint pains were most intense in the morning and increase the load during movement of the joint, while at rest, they substantially mitigate and almost disappear. Arthrosis of the knees is caused by chronic disorders, which have a period of sleep or worsening of the disease due to excessive involving of physical exertion, injury, muscle wasting, and weight gain, cold. It is important for patients as soon as they notice the symptoms to contact a doctor as soon as possible i.e. orthopedist, to which the doctor gives a therapy, because it greatly facilitates and stops the disease in the first place. Gonarthrosis of the knee is very specific when it comes to moving on uneven surfaces like for example stairs in buildings and the like. In fact at the beginning there is pain in the knee which is very tough and then it slowly it reduces. The problem arises when we move for a long time, because in that moment intense pain returns. Often pain behind the knee occurs, which is common after prolonged sitting, and it intensifies if we carry some heavy things. In some cases, you can hear the creaking of the knees, as his damage is greater, the pain is present during sleep. Arthrosis symptoms tend to be more pronounced during cold and wet weather. Arthrosis - WHAT IS THE BEST PREVENTION? Be sure to lose weight - each kilogram is an excess, especially those deposited on the stomach and thighs, burdens the joints, causing pain and increasing the risk of contracting arthrosis. Arthrosis of the knee exercises - swimming, cycling, walking, tai chi and other activities strengthen the knee and prevent degenerative changes. However, avoid tennis, football and jogging, because in these sports joints are subjected to high stresses. Avoid cold – always be well protected from freezing temperatures dress warmer during winter months. In fact, even healthy joints at low temperatures "hurt", and braking is more intense if they are already damaged. Less is hyperactive - Stress affects the whole body, including the joints. Every day, spend a little time to relax with music or whatever you prefer. This will relax not only the brain but also the entire body. Note the correct position - make sure that you bend down, lift the burden or crossing obstacles. Wear pads - when it comes to arthrosis of the knee, hip, shoulder, etc., one of the basic rules is to reduce pain by wearing proper footwear, and it is advisable to wear and cartridges made only for you and avoid high heels. For the pain in the joints, depending on the intensity, we use different drugs that act simultaneously and as painkillers. In case of serious damage, apply corticosteroid injection 1+ which are given directly into the knee, while physiotherapy is targeted by exercises of muscles, improves mobility of the affected joint. If any of this fails, it is necessary to have a knee surgery. 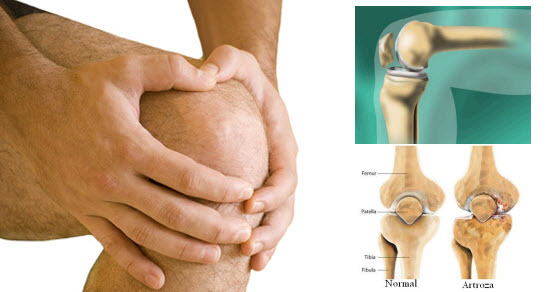 On the free market you can find products which are intended to restore the cartilage of the knee, which contain natural substances and various vitamins and minerals. Also, arthrosis of the knee may be reduced medicine based on herbs which are prepared quickly and easily. There are many natural remedies that with drugs are successfully used to treat the disease of the joints like arthrosis of the knee, they certainly are not in themselves sufficient if the disease progressed. Fresh leaves of comfrey are mashed well and applied on the painful site, and then twist the plastic wrap and consolidate with a woolen scarf. Leave it to act overnight. For the same purpose a finely chopped fresh root of comfrey can be used, and wraps are applied until the pain stops. Melt on a mild temperatures 250 g of unsalted pork fat or butter, and add a handful of chopped comfrey root and mix for half an hour. Shelter from the heat, cover and let it stand overnight. In the morning warm up a bit, just to dissolve, strain and refrigerate. Apply on a painful site at bedtime, wrap in a plastic wrap and keep warm with a scarf. Mix equal parts honey, flour, apple vinegar and grape or plum brandy. Mix until you get a homogeneous mass, and then applied to the painful knee and twist the plastic wrap and fasten with a cotton scarf. Leave it to act overnight. Repeat for 10 days. Apple cider vinegar and honey will eliminate pain and improve joint mobility. Peel two lemons, remove seeds then grind them and add 4 tablespoons of clay and one egg white. Mix until you get a uniform mass until you get a density of sour cream, and then turn over the gauze or cotton cloth and grind to a painful place. Over put a plastic foil and fasten a scarf, and let it work overnight. Fill a glass jar with crushed horse chestnut and pour brandy over it. Close the jar and let it sit at room temperature for 3 weeks. Drain and soak a cotton cloth, apply on the painful knee, put plastic foil over and attached the scarf. Leave it to act during the night. Repeat for 3 weeks and arthrosis of the knee will significantly be reduced. Spoon of horsetail pour with 2 dl of boiling water and leave it covered to rest for half an hour. Strain and drink before breakfast. During the day drink the following tea: Pour a tablespoon of nettle with 2 dl of boiling water and leave it covered to rest for half an hour. Strain and drink 3-4 cups of tea a day for three days, then take a break of four days, and repeat again and pains in the knee will disappear. Mix 4 tablespoons of burdock and yarrow and 2 tablespoons of shepherd’s purse and 2 tablespoons of the mixture pour with 2.5 dl of boiling water, cover and leave for half an hour. Strain and drink every hour. The treatment lasts for 2 weeks. Mix 3 tablespoons of chamomile and elder and pour into the cotton bag, and boil. Then remove and leave to cool, then grind on a painful knee. Twist the plastic wrap and attach a scarf. Hold at least 2 hours. Repeat for 10 days. As you can see there are many folk recipes for the treatment of painful joints, which are the main symptom of the disease. Please share in the comments your experiences if you have them. Please note that today on the market there are all kinds of things so the consultation with the doctor before using any medication is very important.